April 4th started early, with a 4AM text from long-time colleague and friend, Deputy Secretary-General Kim Choony of the nation’s largest environmental NGO, KFEM, sharing an update on the planned opening of three Peace Trails into the unintended ecological sanctuary of the DMZ; and finished more than 19 hours later with another text from her at 11:30PM, confirming some details on the Second Hwaseong Symposium on May 13th, which Birds Korea and KFEM are helping to organise together. And in between? A very full day of work – made successful in very large part because of Choony’s fierce honesty and decades of experience as an environmental activist and campaigner. 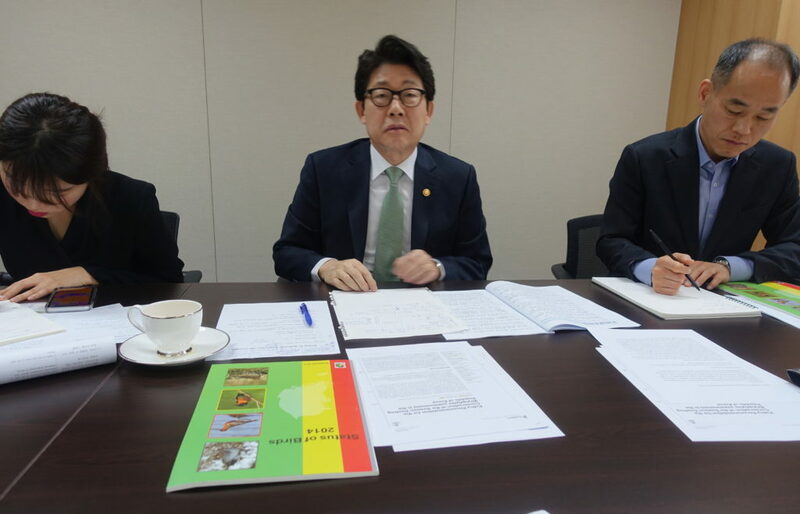 First up after a nearly three-hour train ride from Busan was an hour-long meeting in Seoul with the Minister of Environment (MOE), the honorable Cho Myung Rae, and Dr Lee Joon-Hee, the Director of the Biodiversity Division, Nature Conservation Bureau. First proposed by Choony (as she prefers to be addressed by friends and colleagues) and coordinated by Biodiversity Division Deputy Director Shim Eun-Su, this meeting was arranged to present a Domestic-International Perspective on the Korean Biodiversity Crisis to the Minister, initially by three ROK-based conservation practitioners born outside of Korea: Dr Lew Young of the EAAFP, who so tragically passed away before this meeting was held; Dr Amael Borzee, a leading authority on amphibians (and happily, also a Birds Korea member); and myself, on behalf of Birds Korea. In addition to our providing several pages of detailed comments organised into agenda items and discussion points as requested by the Ministry before the meeting, during the meeting itself my own comments were focused largely on the following: expressing thanks for the opportunity to meet with the Minister and the Director; making explicit our support for the Ministry of Environment in their efforts to progress – against many headwinds – toward meeting the Aichi Biodiversity Targets and in trying to conserve the nation’s biodiversity; respectfully calling for the Ministry to develop and publicise a one-paragraph mission statement or call for action focused on addressing the biodiversity crisis which could then be shared with local GO offices, wetland and nature centres and with Civil Society (as part of progress toward Target 1); and the need to improve data analysis and sharing, and to use data more effectively in supporting decision-making (a request in accordance with Target 19). This included the general observation that data on birds being generated by the Ministry over the past two decades have seldom been shared or analysed or even made relevant to decision-making, a view supported by two specific examples. The first was the lack of analysis of the MOE Winter Census dataset, which would help show very substantial declines in most species of Anatidae in the past decade especially; and could have been used to help identify some of the impacts of the ecologically disastrous Four Rivers Project; and the second example was Birds Korea’s research on the Scaly-sided Merganser conducted as ROK NGO partner to theEAAFP Task Force on the species. After Birds Korea conducted two national surveys on the species, we submitted our report to the EAAFP Secretariat (cover above), and sent the same by mail to our main contact in the ministry. This report was replete with details, including numbers and the coordinates of count sites. All the same, we received zero response. Moreover, as noted in our pioneering Status of Birds Report which reviewed the current status of 365 of the ROK’s regularly occurring bird species and their habitats, the Ministry – as formal government partner to the same Scaly-sided Merganser Task Force – did not even reference our research in any of their subsequent publications (e.g. in their 2014 IUCN status assessments). 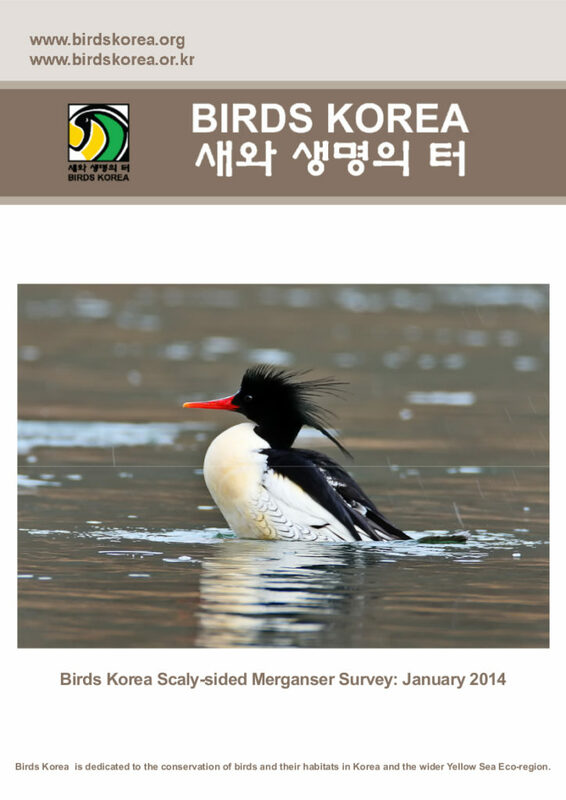 Our main concern: How can the ROK successfully halt and reverse the negative trend in globally Endangered species like the Scaly-sided Merganser, as called for by Aichi Biodiversity Target 5 and by the species Action Plan, when best information that is provided is simply ignored? My own contributions reinforced in no small part those of Dr Borzee, who presented some of the results of his exhaustive research on amphibians, which confirms that many sites are still being degraded and that some species, including the Suweon Tree Frog, are in rapid decline. Most encouragingly, the Minister and Director both showed much interest and expressed their appreciation for the discussion. Helpfully, they shared their own valuable perspectives and ideas, and the Minister made the important observation that although sometimes the relationship between government and NGOs can be strained, that the current administration is doing what it can to work together with civil society to address a host of shared issues of concern – from micro-dust and pollution to biodiversity conservation. Importantly, the respect and appreciation shown to KFEM’s Deputy-Secretary Kim Choony by several Ministry of Environment officials before and during the meeting; and the willingness shown by the Minister to make time to discuss such potentially-sensitive issues together, were actions that strongly support the Minister’s words. Our thanks to the Minister once more. Second, only ten minutes after the meeting concluded, we were already on our way to join what both Dr Borzee and myself had understood would be a press briefing – but which turned out instead to be a demonstration organised by Choony and KFEM against a decision taken on April 3rd by central government to open three peace trails into the DMZ later in the month: one each in Goseong County, Cheorwon and Paju. This decision on peace trails is, without doubt, a positive and bold step on the road toward trying to reduce tensions on the Korean Peninsula – especially as it is also being taken to honour the centenary of the sacrifice of those who lost their lives during the 1919 uprising against colonial rule (as we learned during the day, some of these violently-suppressed protests started in Hwaseong – where we were to go that afternoon – before spreading throughout Gyeonggi). 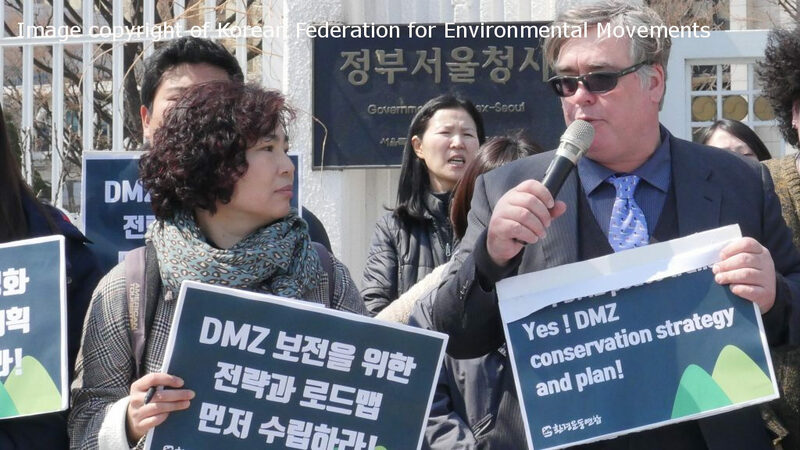 While supporting and appreciating steps taken to reduce inter-Korean tensions, in common with many colleagues in KFEM and the wider conservation community, Birds Korea is deeply concerned with this proposal in its current form. First, the DMZ is an ecological sanctuary, an accident of a decades-long military stand-off. In addition to becoming a symbol of war and hope of peace, this narrow strip of land now contains almost the last wilderness on the Korean Peninsula. Viewed by some developers as the next big construction frontier, the DMZ is also known to support a diverse assemblage of globally threatened wildlife, including wintering Red-crowned Cranes and breeding Black-faced Spoonbills and a host of shy or sensitive species. 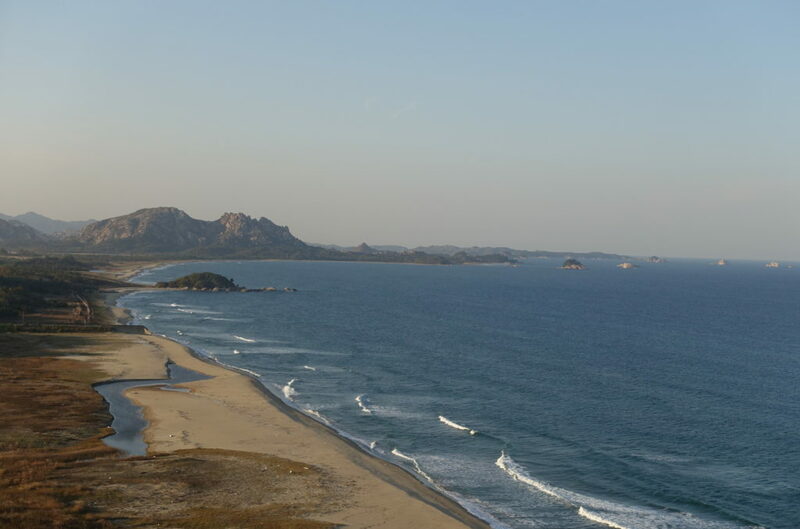 These likely include a host of Korean endemic or regionally endemic animal and plant species, many of which have been extirpated from much of the rest of the Peninsula. It is this kind of ecological value which means that the DMZ is important now not only to Korea but to the world – a fact that is already well-recognised locally, including through the celebration of cranes in road signage and in tourism efforts, and globally through the establishment of groups like the DMZ Forum. Very little scientific research has been conducted within the DMZ itself because of lack of access, so before any development is permitted research needs to be conducted in order to determine which are the most sensitive areas, and to inform decisions on which areas are okay to open up to tourism and which need to be kept inaccessible. Second, there are already innumerable examples of developments in the ROK which initially were limited in scale (as with the proposed peace trails), but which every year grow relentlessly, until the places become degraded beyond recognition. Examples can easily already be found in Goseong County (Hwajin Po is just one of these), in Cheorwon, where parts of the formerly rural CCZ have quickly turned into business-as-usual building sites, and in Paju. A well-considered science-driven management plan and conservation strategy that considers ecological and cultural values is therefore urgently needed before development of any kind is started within the DMZ. And third, is it really wise at this time to make rapid decisions on the DMZ more or less unilaterally? How would people feel in the ROK if the DPRK were to abruptly change its access rules to the DMZ? In addition to the potential danger to tourists who go there, could this potentially positive initiative inadvertently undermine the development of long-term inter-Korean environmental projects and trust-building efforts in general? Following lunch with some KFEM staff (talking through a range of projects with Dr Amael Borzee, including ecological mapping and installing frog ladders on Baekryeong), Choony and I then continued on down to the bleak new city of Dongtan which is being built close to Hwaseong, for the final work block of the day. There – surrounded by seemingly endless plastic and concrete (and, also happily by some coffee and muffins!) 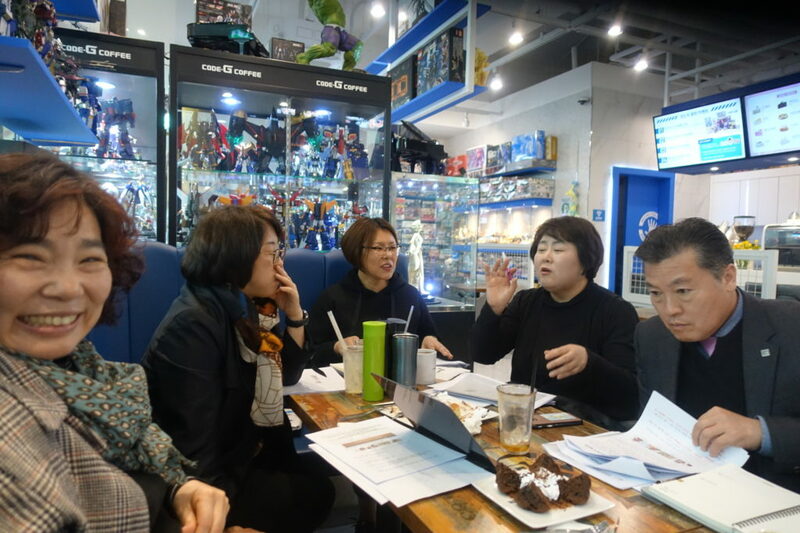 – we met with Director Park of Hwaseong KFEM and officials from Hwaseong City led by Team Leader Kwak Jae Hong, to spend the next four or five hours discussing details of the upcoming May 13th symposium in Hwaseong. Intense discussions about the upcoming Second Hwaseong Symposium © Nial Moores. 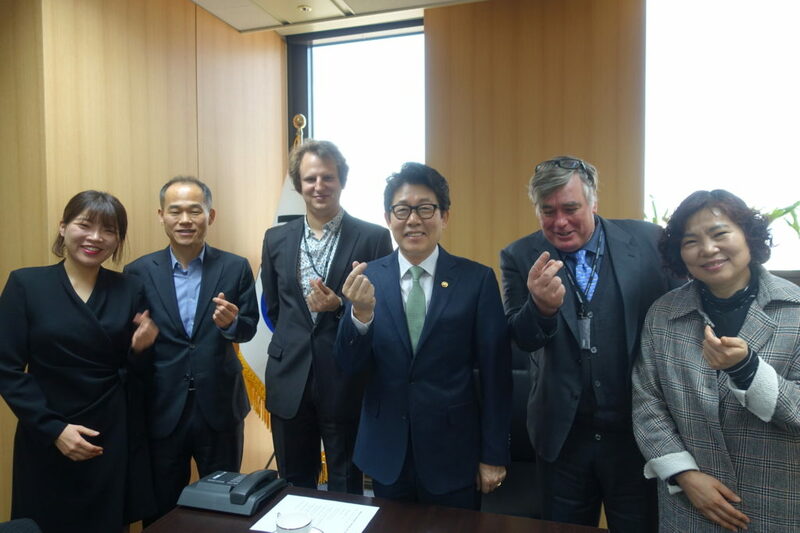 Sitting on the left, a smiling Choony, a pensive Secretary-General Nam Gil-Hyeon of the Hwaseong City Council for Sustainable Development; and on the right, Hwaseong KFEM Director Park Hye-Jung and Team Leader of Hwaseong City’s Environmental Bureau Kwak Jae-Hong. The first symposium, held in September last year, helped enormously in improving conservation opportunities for the Hwaseong Wetlands, which were designated as an EAAFP Flyway site only three months later – after 20 years of loss and degradation. The second international meeting aims to help strengthen the development of a management plan for the wetland in support of the the mayor’s publicly stated intent to designate the Hwaseong Wetlands as a Ramsar site by 2021. Without any doubt, as in many other places inside and outside of Korea, the city faces many challenges in achieving this goal. Foremost of these, popular and political support for conservation and wise use needs to be earned, to head-off all of the demands from construction(-addicted) lobbies. Thanks to the involvement of SAVE International (who played an active part in last September’s Great Flight symposium), a group of passionate UCLA students, KFEM and some input from local stakeholders, we have already started developing some basic plans for the site, which we believe will be valuable in helping to promote Hwaseong City and in helping the city to move towards greater environmental sustainability. We hope to refine our ideas and plans much further through site visits and more meetings in the run-up to the symposium, enriched by the input of several invited experts (more on these a little later!) and then share them at the symposium itself: the first such wetland planning symposium in the ROK to date? Until then, thanks once more to Choony and all who made April 4th such a productive and positive day!